A home with a thatch roof immediately makes one think of country cottages, roses round the door and chocolate box images of the perfect home in the country. It may be a dream for some people but for others, who are building their dream home there are more practical things to consider. Around five percent of new builds each year have thatched roofs so there is still an interest in this age old craft. For the uninitiated a thatched roof is made from dry materials such as straw, rushes, heather or reeds. The material is laid in such a way that water cannot penetrate the layers but is shed away from the roof in the same way a tiles or slate do on a conventional roof. The art of thatching is one of those country skills that to some extent have died in this country. The skills are passed from generation to generation but with so few homes now thatched there are not the opportunities for new people to make a good living from this age old trade. There are different techniques to thatching a roof and this is what gives the different designs to the finished roofs. The material is put into bundles that are then laid by a skilled thatcher. Insulation is greater in a thatched roof and sustainable material is used making this form of roofing very popular with those wishing to build eco friendly homes. Irregular roof shapes and sizes can be covered easily with the thatch material rather than tiles. If the pitch of the roof is around 50 degrees then water will run away naturally and is not absorbed by the materials in the thatch. The ridge of a thatched roof can last around fifteen years depending on where the house is built and the weather. Roofs were once covered in chicken wire netting but it is not used these days as it is thought to speed the erosion process of the raw materials. The roof can weigh more than a conventional roof and as layers are usually added rather than removed it is vital that enough roof support is provided when the house is first built. It is documented that some listed properties in the south of England have roofs that are over 500 years old. 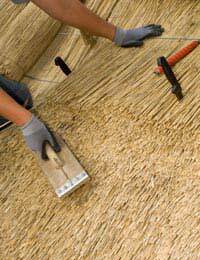 The cost of thatching a roof is more expensive than a conventional roof. Quote should be taken from craftsmen and also visit houses that the thatcher has worked on in the past and speak to the owners. A rough rule of thumb is £125 per square metre when calculating costs. The insurance premium paid for a home with a thatched roof does cost more than for a traditional roof as it is thought that it is likely to be vulnerable in a fire. Usually it is the badly built chimneys that are to blame for starting a fire and a thatched roof is as likely to burn as a conventional roof. However, once a fire takes a hold in a thatched roof it is harder to extinguish. For a keen self builder the thought of thatching the roof to their new home can be quite inviting. Perhaps rather than take on this task yourself it would be an idea to assist the thatcher in his work so that you know how your roof is created and so you can pass onto your family the story of how you helped build the roof rather than do it yourself. This type of country craft takes many years to learn and is not something that can be learned from a book or the internet. It is possible to take classes in the ancient country craft which will give an idea of the processes of how your home is to be roofed but leave the actual job to a craftsman.